Banaba Leaf Extract: A Natural Diabetes Remedy? According to the American Diabetes Association, 25.8 million children and adults in the US have diabetes. That's 8.3% of the population and represents a 14-fold increase since 1960. This high growth has led to a growing number of pharmaceutical drugs attempting to treat the problem -- and with those drugs, a host of dangerous side effects, such as increased risk of heart failure. It's no wonder people are looking for safer, and possibly more effective, natural alternatives. Fortunately, there just might be a powerful natural alternative with banaba leaf extract. Banaba leaf, not to be confused with “banana” leaf, has been used for thousands of years in India and the Philippines to naturally treat diabetes and low blood sugar levels. It turns out these cultures were onto something -- banaba leaf and blood sugar control go hand in hand. The blood sugar regulating properties of corosolic acid, the active ingredient in banaba leaf, have been demonstrated in cell culture, animal, and human studies. In isolated cells, for example, it is known to stimulate glucose uptake. In fact, some studies have shown that it can help lower blood sugar within sixty minutes. It has also been shown to help correct leptin problems and food cravings that are typically found in overweight individuals who have elevated blood sugar. 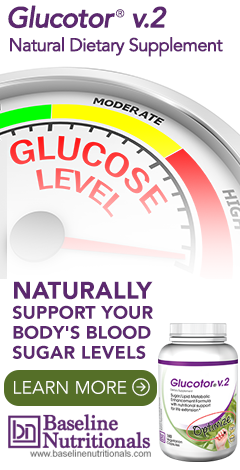 The average human response is a 10-15% decrease in blood sugar within two hours of ingestion. For this reason, it is found in many sugar metabolic enhancement formulas including Jon Barron’s Glucotor. In diabetic mice, rats, and rabbits, banaba feeding reduces elevated blood sugar and insulin levels to normal. In humans with type II diabetes, banaba extract, at a dose of 16-48 mg per day for 4-8 weeks, has been shown to be effective in reducing blood sugar levels (5%-30%) and in maintaining tighter control of blood sugar fluctuations. An interesting "side-effect" of tighter control of blood sugar and insulin levels is a significant tendency of banaba to promote weight loss (an average of 2-4 lbs. per month) – without significant dietary alterations. For this reason, it is found in many weight-control formulas including Jon Barron’s Accelerator Meal Replacement shake. It is likely that modulation of glucose and insulin levels reduces total caloric intake somewhat and encourages moderate weight-loss. The leaves also contain the minerals manganese and zinc. Extracts from the seeds have been found to have powerful antioxidant properties and are in fact being researched as a possible HIV treatment. The corosolic acid in banaba leaves isn’t just good for blood sugar levels either. Researchers at Changhai Hospital in Shanghai, China tested corosolic acid against human cervical cancer cells. They found that corosolic acid stimulates the release of cancer-cell-killing enzymes, resulting in cancer cell death. Banaba leaf may also be effective in treating metabolic syndrome, a group of pre-diabetic conditions that increases susceptibility to heart disease and stroke. Researchers at Mukogawa Women's University in Nishinomiya, Japan found that by the end of 10 weeks of treatment with banaba leaf, blood pressure had been lowered, fat metabolism had normalized, and the body's inflammation levels had decreased. In folk medicine, the leaves were often brewed as a tea, which does work; however, today it can be easily found in supplement form. If you do suffer from blood sugar issues, keep in mind that taking banaba along with diabetes medications might cause your blood sugar to go too low. As always, if you are using medication or under a doctor’s care for any medical condition, be sure and check with your doctor before using any herb or supplement. Does low blood sugar really kill diabetes? Learn more about preventing diabetes. My brother is a newly diagnosed diabetic. Official date of diagnosis was the 2nd week in November. At the time he was Appx 184 pounds. He has been experiencing constant, intolerabe pain in his legs. To the point of crying. And with 3 months he has lost a massive 50 pounds. He is now 128 pounds. He was precribed metformin and I believe it's gammapentin...I'm not too sure if I spelled that correctly. There are others but at this moment I can't recall. Anyway, his blood sugar levels are alway within the range of 115 to 2-240 with the finger sticks. He has never had a lower read. The pain affects his walking and he is unable to keep on shoes or socks for a long period of time. His color is good when you look at his feet and legs. There are no marks or any sign of damage, no cuts, no sores....nada. I just don't understand this constant pain. My question is: should he take this banaba leaf supplements to aid in pain relief? Is it it a good idea knowing that this supplement also promotes weight loss? Losing that much weight that quickly is exceptional, even for a diabetic. He really might want to press his doctors to search for another cause. As for the pain, if it’s related to the diabetes, then it sounds like diabetic neuropathy. And there are things doctors can do for that—but also any supplements that help optimize blood flow could be helpful. And as for the weight loss associated with the formula you’re talking about, that’s both from moderating the rate at which the body absorbs sugar and evening out the glycemic response. If he’s taking metformin, then it is unlikely the supplement would add to the effect, which means that it is unlikely to add to any weight loss effect. In any case, for obvous legal reasons, we cannot diagnose or prescribe for specific medical conditions. You will want to talk to your doctor, or find a local holistic doctor you can work with. I've diabetes and legs pain too , my diabetes is just over 30 yrs .my experience with legs pain with leg pain is so great with tart cherry extract ( Black cherry extract wasn't better in my case) and diabetes I have to take insulin bc metformin and other orals not able to control very well any more .......But recently I can't afford health insurance and I can't get help from Obamacare - So I'm using Alternative formulas to help me very much and I can feel better compare to drugs from health insurance . But one thing I realize is the blood acid needed to check the PH level and try to correct the level within the healthy range - You need to work with the Doctor to help to bring health Ph in rang - BC acid in your system is where all kind of diseases coming from. I recently found out I am a type 2 diabetic and was experiencing pain in my feet and legs, although not to the level your poor brother has been suffering. I have found some relief by using a "Revitive" electronic circulation booster a couple of times a day. I purchased one of these through Amazon and believe it is helping to reverse the effect of the diabetes. The model I have is the "CX" which also includes two sets of "Tens" pads which can help with other painful areas. Leg pain is a serious side-effect of Metformin. Your brother needs to strongly tell his doctor. He also needs to make sure he is not having any stimulants, coffee, etc. I have to take 1500 mg of magnesium at night to sleep and relax the nerves. No sleeping pills. Doctor needs to check his thyroid and for Lyme disease and pancreatitis, too. If the doctor refuses or laughs at it, get another doctor!! Read up on Metformin side-effects and also for all the other drugs and do they safely interact with each other. But most of all, make sure your brother doesnt think he can have sugar and take a pill. That is not ok.
And stop Tylenol and any pain stuff. Bad interactions happen. Next read "Grain Brain". And "Brain Maker". Gluten is a huge Diabetic enemy. Hope this helps! Leg pain with Metformin is your first flag waving. Thanks so much for sharing this info. I had know idea metformin had leg pains side effect...wow. I've been on metformin for about 10 years and last year the leg and feet pain started. I have decide to ween myself off. That's how I found this forum. Again thanks for sharing. Now I understand! The first day I took Banaba Leaf, I was so tired I could barely keep my eyes open at work. I am wondering if this was just a coincidence or if Banaba Leaf caused this? My mom is 80 years old,if she has even a few grapes her sugar goes high. She is full insulin dependent. Her weight is good. She has no pains. She does not like Tea . Is there a supplement that has some of this in it that would help? I have had her taking Ceylon Cinnamon for about 5 months, can't really tell if there is a big difference as she is in a Senior Share Home. But I wish she could enjoy some fruit. Her sugar does run over 200 at all times. Thanks . As far as a Doctor we just moved from Vt to Va and he is new. She has not had a Specialist. There is none in our area. Cure your diabetes. Its your food, don't you get it? Go raw vegan. You will heal.